Our off-the-shelf risk mapping products enable you to access locked or siloed information from an easy to use interface, set up to give you simple, unrestricted access to entire libraries of information that was otherwise inaccessible. Now, you can search, query and extract answers to questions that would have previously been difficult to ask. 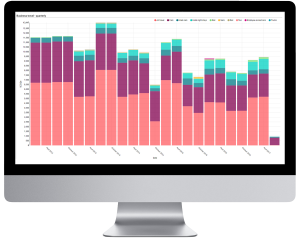 We blend your data with our existing databases to create brand new visualisations and insights for you to use in strategic planning, decision-making and future-proofing. The only thing you need to do is give us your data, and tell us what you want to know. We’ll do the rest. 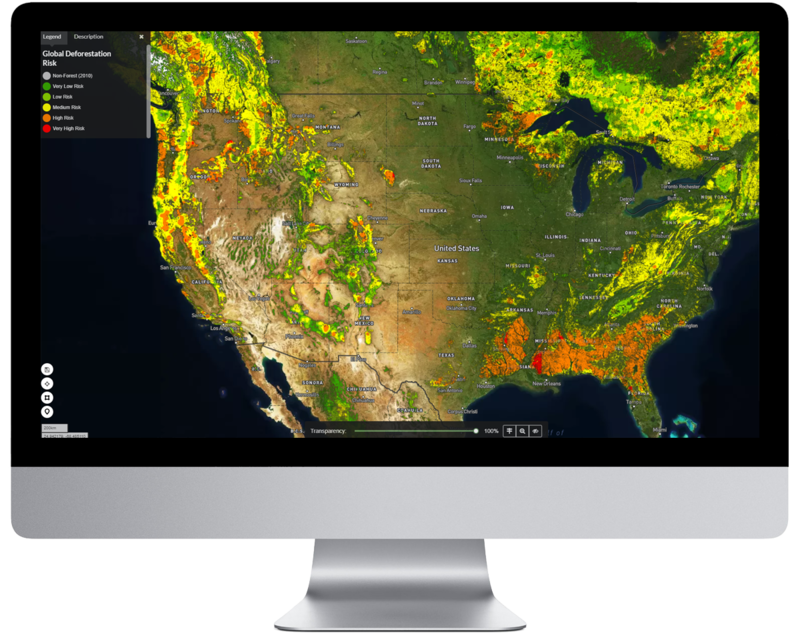 The Risk Profiler is an interactive map interface that gives you high-detail visualisation and analytics for your global land-based assets. 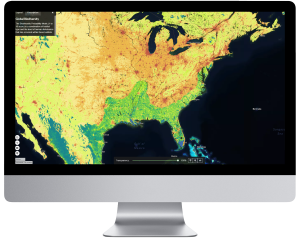 Built on a digital cloud infrastructure, the Risk Profiler allows you to assess the impact of your land-based activities across four dimensions: Water, Forests, Biodiversity and Population. 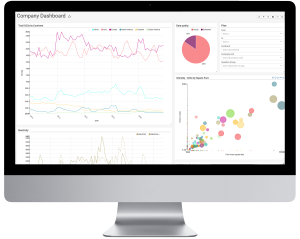 You can either view in a single, high-res mapping interface, or pull all your results into Business Intelligence to see dashboards, charts, aggregations and comparisons. For each asset (for example, farms), the Risk Profiler allows you to understand the risk of deforestation, the level to which water resources are stressed by human activity, and the pristineness of the area. 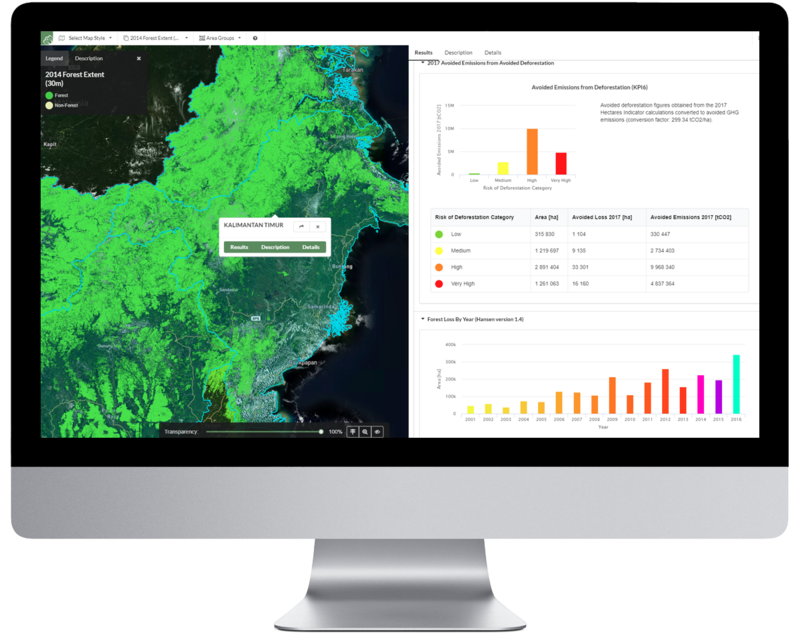 At aggregate level, the Risk Profiler gives you detailed reports on the total area within each deforestation risk and water stress category, and a biodiversity metric score, broken down across your preferred dimensions – such as country or facility type. You can even track changes in real-time. You send us your asset location (X/Y) data. We put your app together with interactive maps & business intelligence analytics. Oh, your job was done at step one – you can head home. Maybe a nice weekend break? If you like, you can come back later with more details on your areas for us to build in. We could also push our content into your internal systems, to put our info in your context. Want live, real-time monitoring of your assets? No problem. We can do that as well. The Risk Profiler is a strategic insight tool for high-level value chain decision making; a risk management tool to help understand your exposures; and a communication tool for sharing all your sustainability actions and initiatives with your clients. 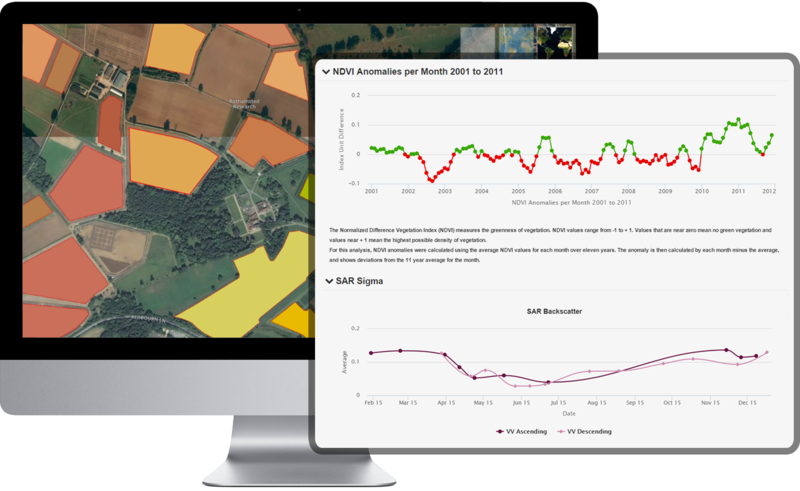 Ecometrica is the only company that combines geospatial mapping and earth observation technology with traditional environmental accounting for a total organisational sustainability picture, all within a single platform that can be easily controlled by non-expert users. From our software, you can observe change, assess risk, spot opportunities and create strategic plans more quickly and simply than ever before. Run on the Ecometrica Platform, it facilitates the detailed measurement and management of water use, pollution and environmental impacts to a greater extent than was previously possible. The Water Footprinter breaks water consumption down into three discrete categories. ‘Green Water’ is rainwater used by agriculture; ‘Blue Water’ is that drawn from groundwater or reservoirs, for irrigation or other use; and ‘Grey Water’ is the amount needed to dissipate any pollutants added to the water supply. Ecometrica’s Bertil Abbing, who leads the development of Ecometrica Water Footprint software, explained: “The competition and demand for fresh water is increasing and seen as a systemic risk facing businesses. Research estimates that worldwide agriculture accounts for around 70% of all water consumption, compared to 20% for industry and 10% for domestic use. However, in industrialised nations, industry is reported to consume more than half of the water available for human use. Ecometrica is at the forefront of developing and applying methods for assessing the effectiveness of interventions aimed at reducing deforestation and forest degradation. We support the UK’s International Climate Fund to quantify the hectares of forest loss and degradation avoided through the investment of over £1 billion from 2011 to 2021. To this end we have developed The Hectares Indicator – the most widely used method for forest sector aid programmes to assess their impact in terms of reducing deforestation and degradation. The Ecometrica Platform is used to compile the relevant data and analyse and present the results.